Either this building was more elegantly designed in the first place, or it has been beautifully renovated recently. In either case Dicksons Mensland is very refined Deco. It is certainly well maintained and I hope it was built in 1939 when Dickens moved there. I'll pop in one day and see if they know. 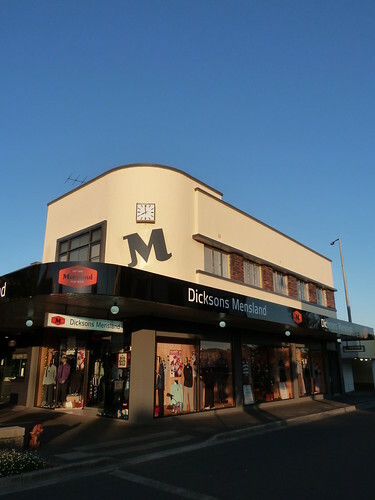 The Dicksons Mensland building was built in 1939 with the architect being Rhys Hopkins. There are 2 other buildings in the town that were built in the same design but have not been maintained as well as ours. They the Warragul Sale Yards office and Alex Scott Real Estate in Queen St.
Than you very much Malcolm for confirming some of the info in my post. I've seen the Warragul Sale Yards office but I'll have to take a look at Alex Scott's office. Thanks again for the info. Much appreciated.